At times it felt like the playing field was just the personal playground of WR Gatlin Casey, especially when he broke free for a 93 yard kickoff return for a touchdown. But it was more than that. At other times, it felt like the defense, with freshman FS Riley O’Neil pouncing on a loose ball after a sophomore SS Sam McCloskey forced fumble. was the critical piece to keeping Colgate from winning this game. But it was more than that. And at other times, it felt like the offense, under the expert signalcalling of senior QB Nick Shafnisky, kept finding big plays, on many occasions to Casey, that kept the game out of reach for the Raiders. 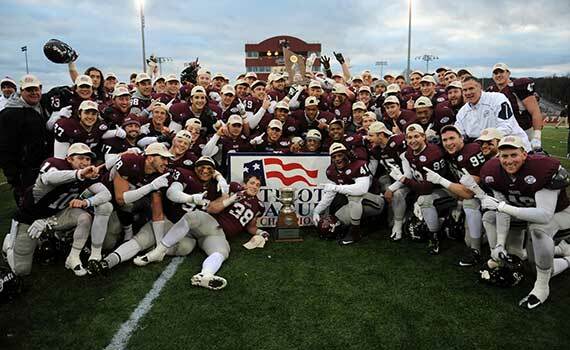 In reality, it was all three phases of the game for Lehigh that finally formed the chemical reaction somewhere in the middle of the first half that erased a 17-7 deficit and transformed the different bits and pieces into an impressive 45-31 victory. For in the first half, down 14-7, the game looked like it might just get away from the Mountain Hawks. 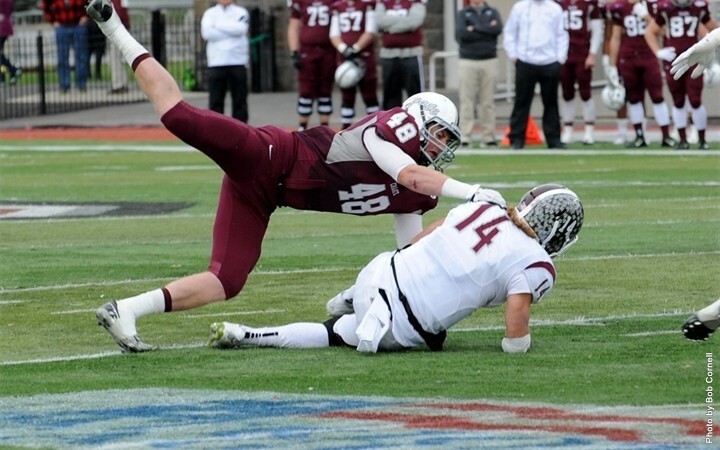 There’s no question that this weekend’s Colgate and Lehigh game is an enormous game for both sides. There’s also a bit of a quarterback “controversy” on the Lehigh side as to who will come out for the first series, award-winning sophomore QB Brad Mayes or award-winning senior QB Nick Shafnisky. Added to the already-challenging coaching twists centering around 4 O’Clock exams, something that head coach Andy Coen reminded me of last week, is the concern that the fourteen Lehigh football players from Florida, including Mayes, senior LB Colton Caslow, junior WR Gatlin Casey and a bunch of others, have for their families back at home. You can’t blame some of those athletes being a bit distracted if they have a bit more on their minds than just football. The office seemed a lot lighter than it once was. A committee member looked around, and saw the regular piles of computer printouts, spilled fax ink, and opened folders. Only a radio blaring Extreme’s “More than Words” could be heard. Looking outside, he saw the Committee members outside. There was a new food truck there. Curious, he went out to see. “I’ll have a three-pack of fish tacos with crema,” he asked the food truck operator. He enjoyed the tacos and stopped in the men’s room to check his teeth. Green things in there. Good thing he remembered to bring his toothbrush. “That reminds me,” he thought. Art heard a knock on the door. He thrust open the door, but there was nobody there to be seen. Looking down, he saw an envelope. “The Committee,” it simply read on the back, with a bar code and “100% completion”, written in block letters, on the back. A chill went up Art’s spine as he opened the letter, which had the scent of minty freshness. “Is it those Hamiltonians trying this stuff again?” a businesswoman looking suspiciously like Nicki Minaj said once again. 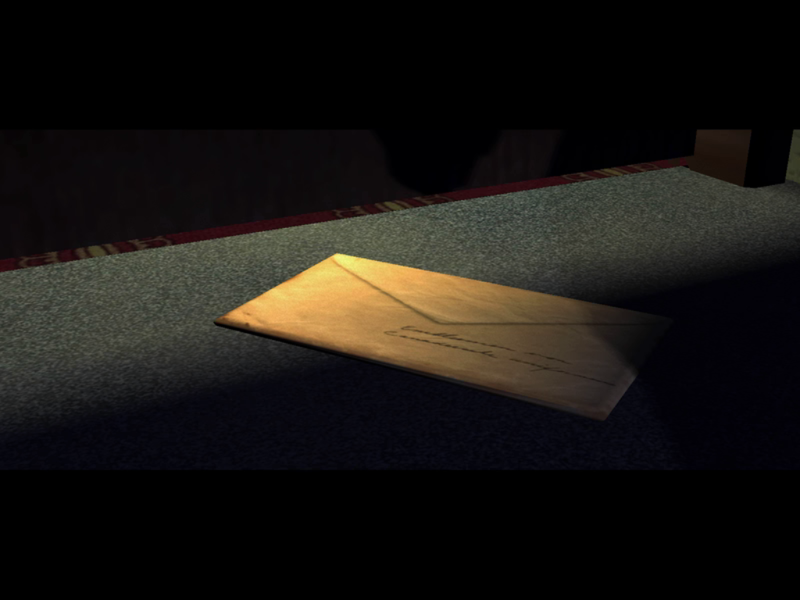 Art’s voice trembled as he read the letter. There was a pause as Art read the block letters of the recruits listed in the letter, as he made sure both deadbolts on the door were locked and in place.